Nice staff, and good location.Everything was very clean. We got amazing treatment from the staff, especially from Eleni. Great location - close to the beach but set away enough for privacy. Rooms cleaned most days. Big fridge Big wardrobe We didn't use the cooking facilities in the room. Hotel cats! The beds were comfortable & there was plenty of cupboard space. Nice & quiet & exceptionally clean. Close to the best beach, shops & restaurants(really good food). The bus stop was also close by. Really lovely & very helpful people running Scala Hotel-Apartments. I would not hesitate to stay there again(beautiful sea view). The location of the apartments was just perfect as the beach was accessible as the main highway to other parts of the island. With a room overlooking the beach and bay it was a perfect view from the apartment. Both ladies at reception (Isabella and Eleni) were both efficient and charming. Daily free coffee in the reception area each day was not to be missed. Fresh fruit upon arrival was mush appreciated. The apartment was cleaned daily along with fresh towels. Nice view from the balcony, good location, near the beach, enough space (we have rented an apartment), very nice and friendly staff. 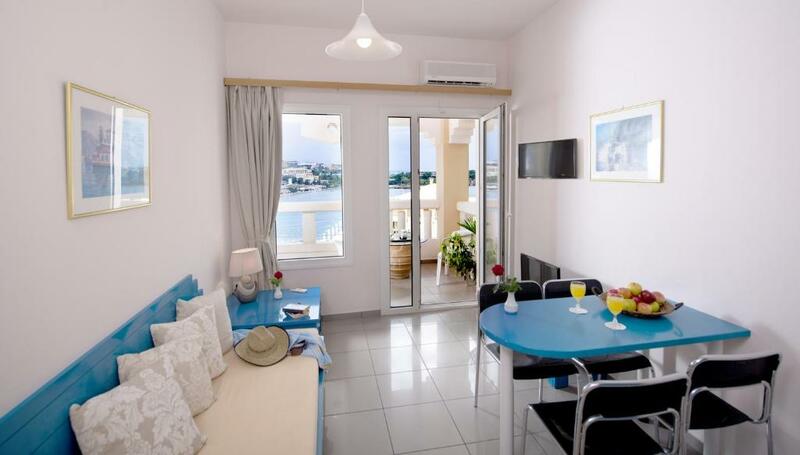 Lock in a great price for Scala Hotel-Apartments – rated 8.6 by recent guests! Scala Hotel-Apartments This rating is a reflection of how the property compares to the industry standard when it comes to price, facilities and services available. It's based on a self-evaluation by the property. Use this rating to help choose your stay! 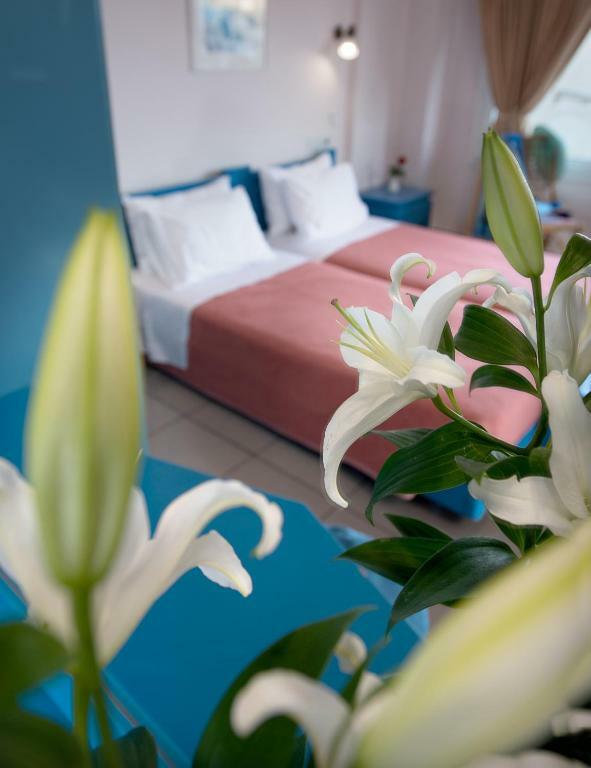 Just 250 feet from the sandy beach, Scala Hotel Apartments is located on the picturesque bay of Agia Pelagia, in Crete. 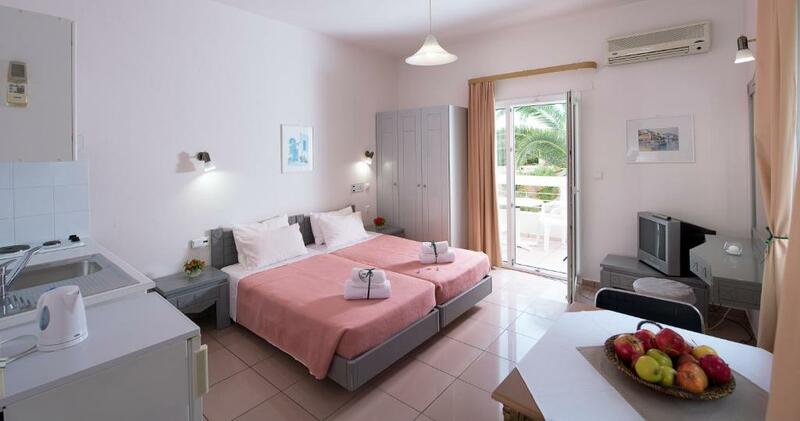 It offers spacious rooms with balconies, most with a view of the bay of Agia Pelagia. The 4-star Scala consists of 3 different buildings, a swimming pool area, an outdoor seating area, a wireless internet corner, nice gardens and a parking area. In the cafe bar and around the swimming pool you can enjoy drinks in beautiful clean surroundings. 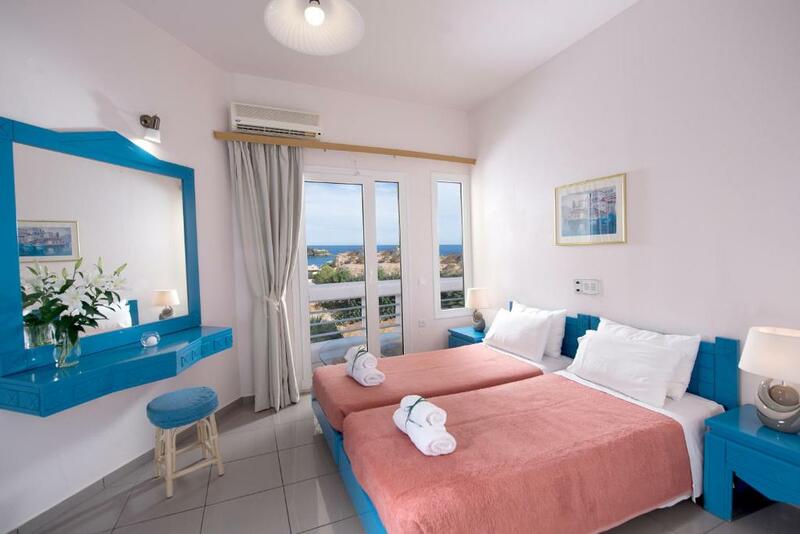 Guests can stay at the hotel and catch some sun in the free sunbeds or a drink by the outdoor swimming pool, or simply enjoy the lovely sea views from their spacious balcony. Fodele, El Greco’s birthplace is 6.2 mi away, while Heraklion and the port are 12 mi, and the airport 15 mi away. The bus stop is conveniently 500 feet away. 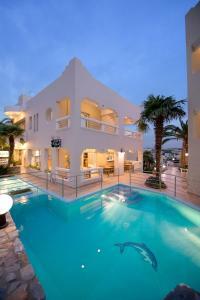 Agia Pelagia is sea resort which offers its visitors both the opportunity to relax and be entertained. The shops in the village provide products and services which cover every need. 뀐 Located in the top-rated area in Agia Pelagia, this property has an excellent location score of 9.1! When would you like to stay at Scala Hotel-Apartments? 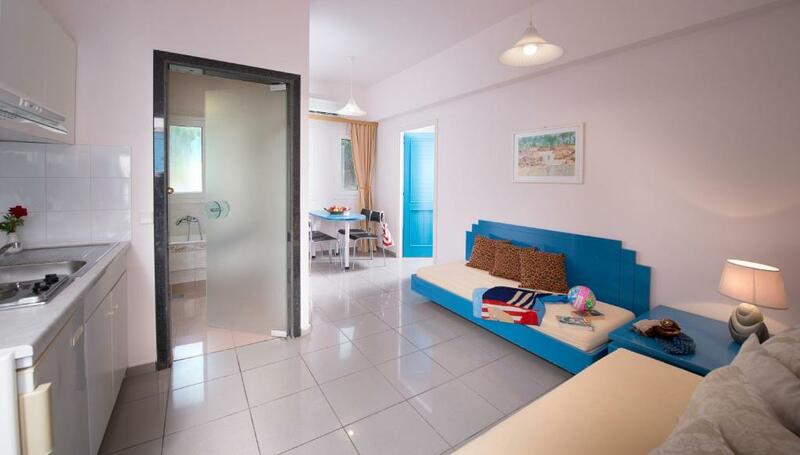 This studio features a balcony, patio and satellite TV. This family room features a balcony, flat-screen TV and seating area. House Rules Scala Hotel-Apartments takes special requests – add in the next step! One additional child under 2 years is charged EUR 4 per person per night in a crib. Scala Hotel-Apartments accepts these cards and reserves the right to temporarily hold an amount prior to arrival. Late departing guests can use the free shower room and towels. Please note that the card used to make the reservation should belong to the guests. Please inform Scala Hotel-Apartments of your expected arrival time in advance. You can use the Special Requests box when booking, or contact the property directly using the contact details in your confirmation. Maybe the bed sheets and towels could have been changed more frequently. As some days the bed was made and straightened up - other days beds were completely left. Think this was depended on who was cleaning that day as to what effort was made. Our bed was also two singles pushed together - which meant a gap appeared in the middle which was annoying - but meant the bed was bigger than standard double. The only work surface in the kitchen was the draining board....additional work surface would have been an improvement. The shower was okay, however, following a shower the whole floor was soaked(poor design). Not very much really. The shower was lacking pressure and a toaster would have been good to have. A little bit of a problem would be the pressure of hot water, sometime, after we have arrive late at 12-01 in the night, it may take a little longer for the hot water to come. Not a real problem but... it worth for other people to know. Clean, quiet, nice personell, close to the taverns.